Vacation rental condominium. Sleeps 7, 1 bedroom, 2 bathrooms. No pets allowed. The living room and dining area have great views of the lazy river and views of the bay. Living room has a sleeper sofa with bed linens furnished for your use. The sleeper sofa has upgraded mattress and the living room has plenty of room even with the sleeper pulled out. With the window blinds open the living room has lots of light. 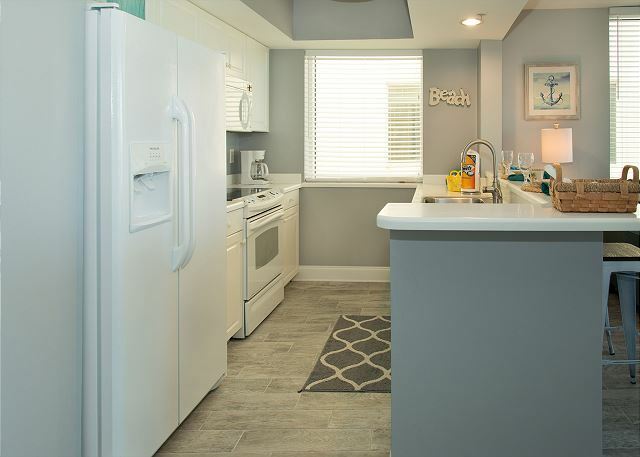 The kitchen is furnished with everything needed for that meal away from home. Enjoy your meals at the four top table or at the bar. All new furnishing and top of the line mattresses will make you happy after a good nights sleep. Chair in Master Bedroom folds out to a twin bed. 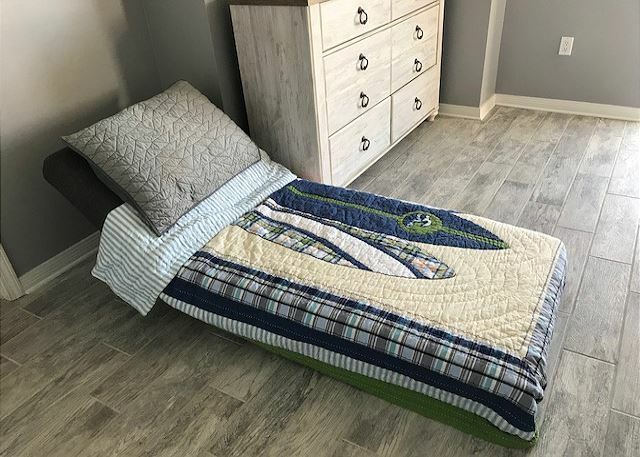 So your little one can sleep in the same room as you but on their own bed. The master bedroom has its own private balcony. So you can have your first cup of coffee in privacy. 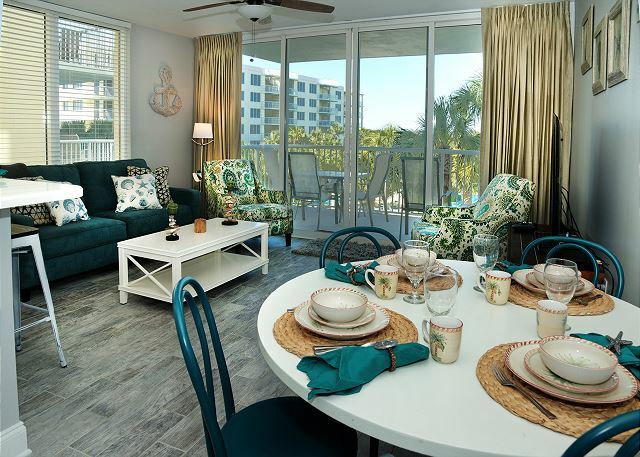 Sandpiper 408 is a very welcoming condo. 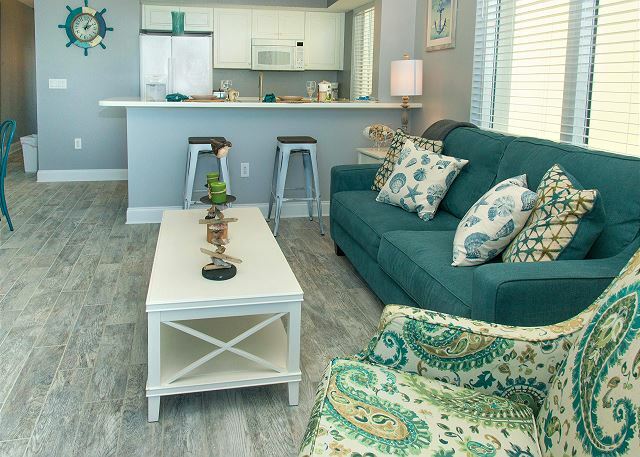 The new tile floors and decor make the condo one that you will hate to leave when your vacation is over. 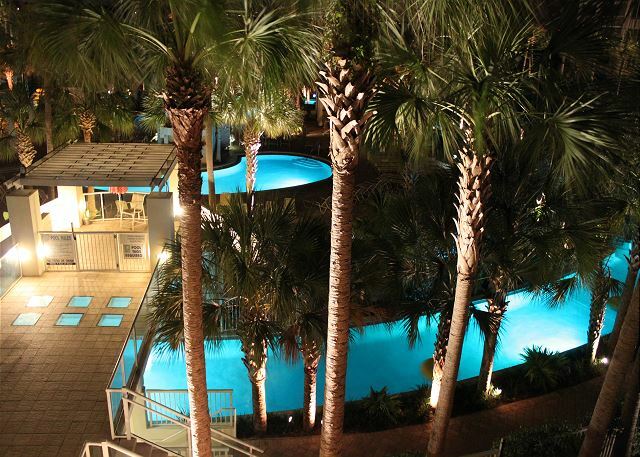 Sit on your balcony and enjoy the rotating lazy river lights at night. 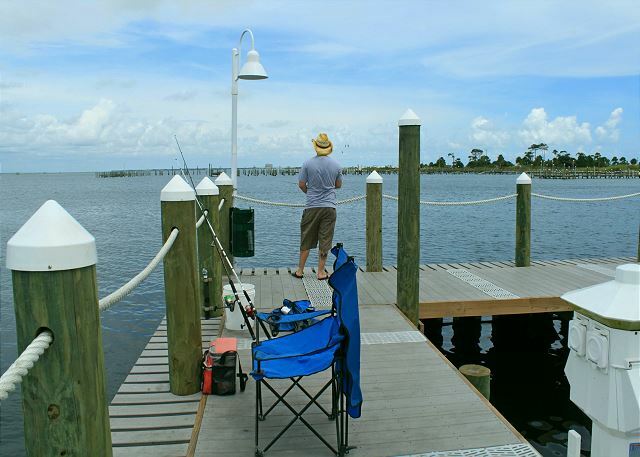 The boat is available to you for just sightseeing or for fishing. If you have a boat we also rent boat slips. 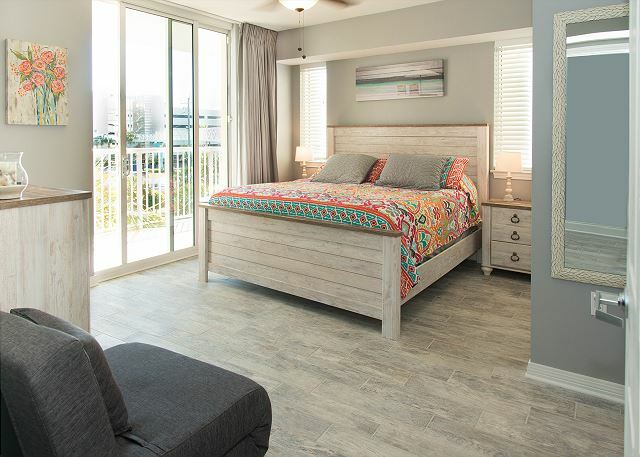 Furnished in coastal decor, this unit has every convenience a couple or small family will need for a pleasurable vacation. King bed in master(custom blackout drapes for those late sleepers), small sleeper char in master that folds out to a twin sleeper for a child, twin size bunk beds in bunk room and queen sleeper sofa in living room. Comfortably sleeps 4-7. 27 inch TV/DVD/VCR, 27 inch TV/DVD in master bedroom,19' TV in bunk room, plenty of dishes, cookware and utensils in the kitchen. Unit has washer & dryer with iron and ironing board. Other amenities listed below. 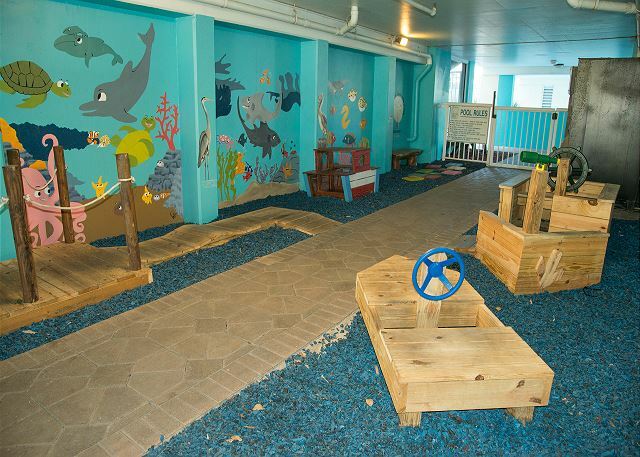 Destin West Beach & Bay Resort is appealing to all age groups. The numerous pools and spas along with the much-loved, lazy river with its easy zero-depth entry, provides lots of entertainment and relaxation. Children and adults alike can't resist the care-free floating for hours at a time. For the beach lovers in the family, a short walk via an over-the-street pedestrian walkway will put you on the beach in less than 10 minutes. The 5000 sq. 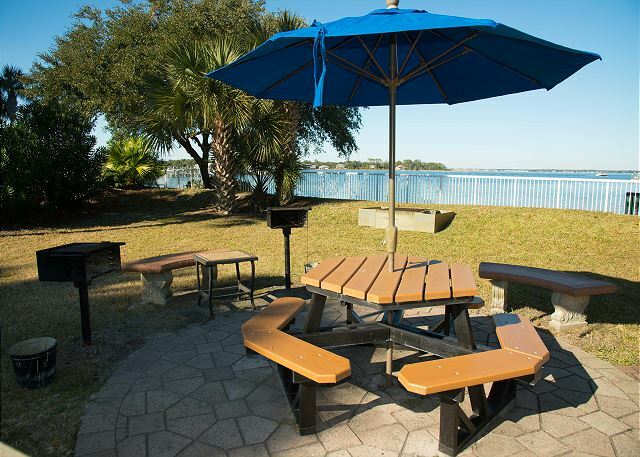 ft. gulf-side pool, kiddie pool and children's splash park are also for your enjoyment. 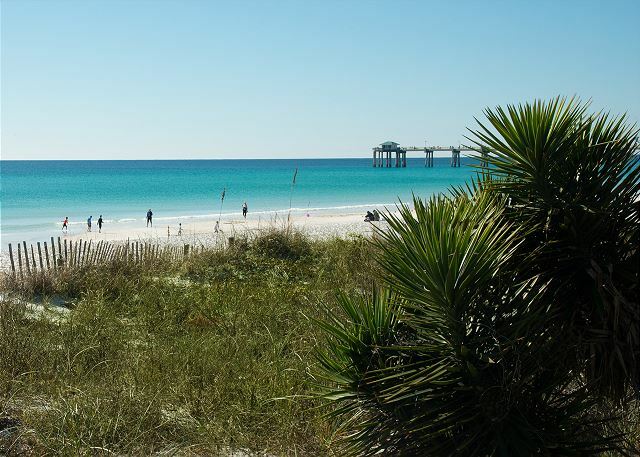 Located only 6 miles from Destin - same gorgeous beaches but no crowds and a lot less traffic! IF YOU HAVE FRIENDS OR FAMILY YOU WANT CLOSE BY, we also manage VRBO# 881913 on the same floor as this condo. 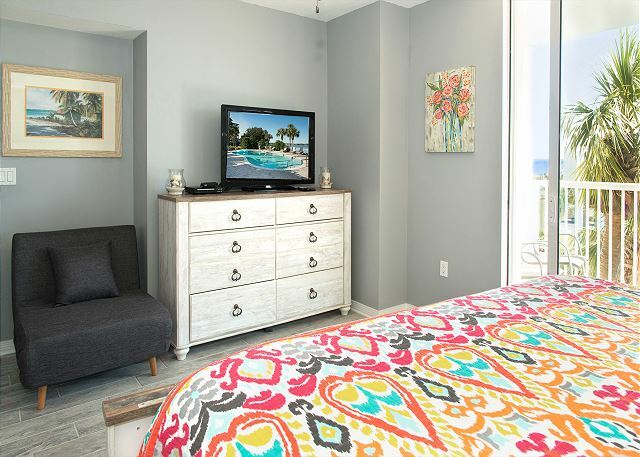 Rooms Sleeps 7, Large Master bedroom with king bed and private bath. Bunk beds are in separate room with private bath attached. Living room has sleeper sofa. 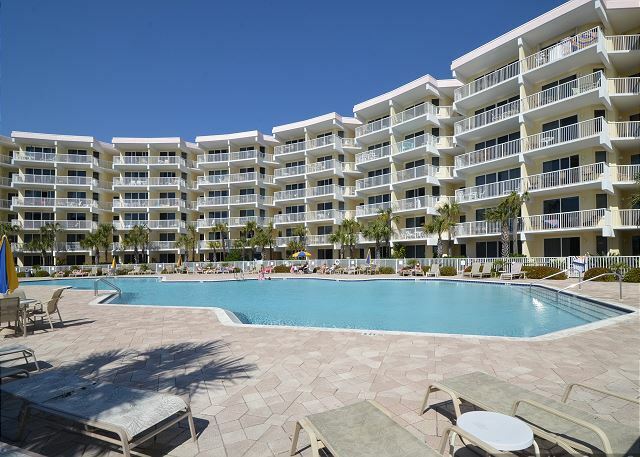 We always stay at Destin West because we love the location! We enjoy both the beach side and the bayside. 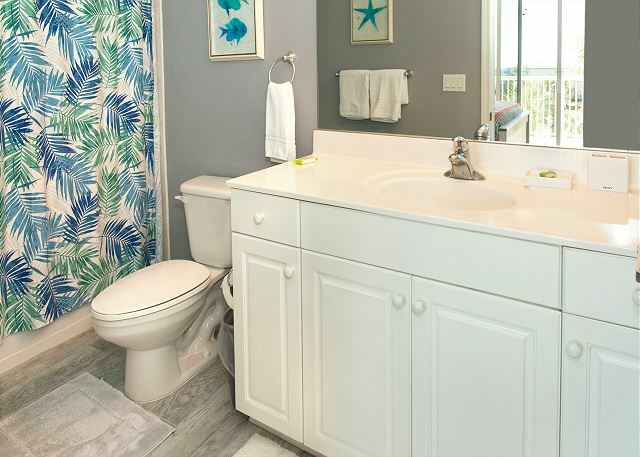 Sandpiper 408 is beautifully decorated, nicely furnished and is exceptionally clean. This unit has everything you need. We enjoyed the balcony view of the lazy river and of the bay. The property manager was very professional and checked on us to ask if there was anything we needed during our stay. We were VERY satisfied. Dear Ms. Ward, Thank you so much for this amazing review! We truly love hearing from our guests and are so pleased to hear you had a great stay! We'll be standing by to help you book your next visit! Sandpiper 408 was perfect for our week stay. The unit was very clean and we were provided with everything we needed for our comfort. We liked that we had plenty of towels and wash clothes. Every staff person we spoke to was very friendly. 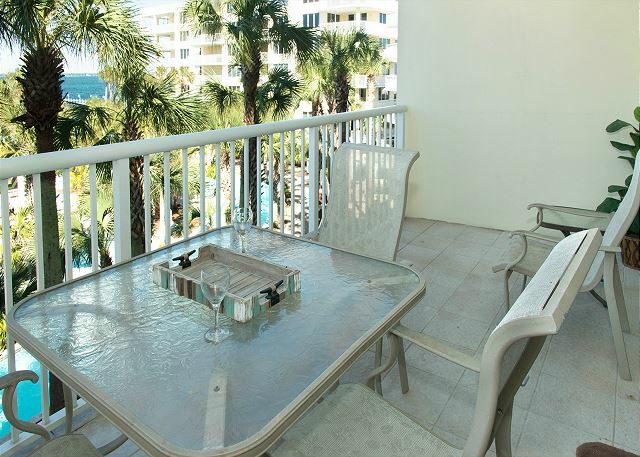 This is the perfect family location with the pools and access to the beach on the gulf side. We would not hesitate to stay in this unit again. Dear Mr. Crissinger, Thank you for taking the time to tell us about your wonderful vacation! We do our very best to ensure that we deliver excellence and are so happy this was your experience! We'll be ready to help you book your next trip whenever you're ready to visit again! Highly recommend this condo. Enjoying a newly decorated and very clean and with a very comfortable bed. Had everything we needed plus a excellent and warm February. What’s not to enjoy. Dear Mr. Hameister, We're so glad you enjoyed your visit in this beautiful little condo! 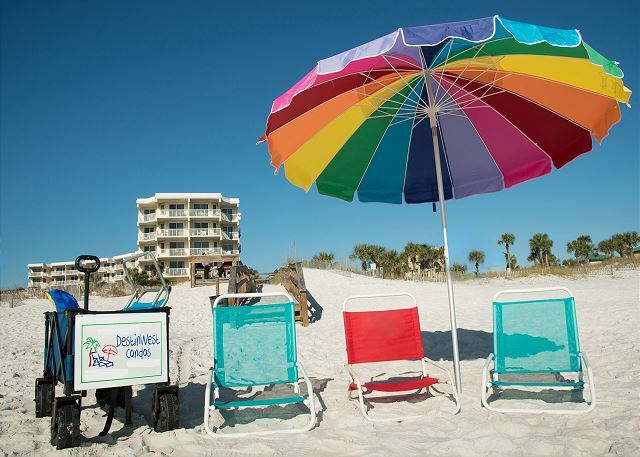 The warmer weather certainly adds to any vacation at the beach and we hope you'll chose to stay with us again very soon! I was in town for nearly a month for training and opted to stay in a place that had a full kitchen, full size bathroom, living room and laundry in-room. Very happy with my choice. Owner was incredibly helpful and responsive. Good Wi-Fi. Short walk to gym and places to eat. Multiple points to enjoy the view. Only nit-picks, none of the provided cups/mugs were microwaveable (no big deal), and when the wind is just right, it howls through front door entrance. Nothing a towel cant fix. Overall -- one of the nicest places I've stayed at. Will be recommending to anyone over the other nearby options! Dear Mr. McPherson, Thank you so much for your positive review! 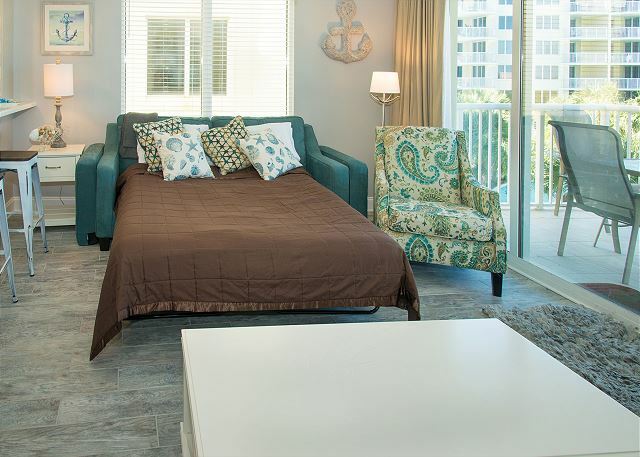 We loved being able to provide you with a comfortable home away from home. Condos are definitely the way to spend an extended stay! Thank you for recommending us to your friends and loved ones. We'll look forward to booking your next trip in the area! We had acFantastic time in this condo. Working with this company, owner and condo was wonderful. It was centrally located, beautifully decorated and very nice. We will go back. Thanks for a wonderful trip. The condo was very clean, and it all the necessary items; towels, toilet paper, dishes, etc. The only bad thing was with a South wind, the front door would make a really loud whistling sound. Otherwise, my stay was great. Great atmosphere. Lovely condo with cute modern decor. Super comfortable master bed. Loved the pool! Close to everything we needed! Kali we are so glad that you enjoyed the condo and liked the decor. We look forward to having you stay with us for your next vacation. Thank you for the great review. We appreciate your choosing our condo for your vacation and hope to see you again next year. Absolutely loved staying in this condo. It was clean and conviently located to many restaurants. We will definitely use this rental again in the future. We had a fantastic time and an enjoyable experience in the condo. Will definitely be returning. This condo was absolutely perfect for my family of four. My two daughters (7 and 9) loved the bunk beds. 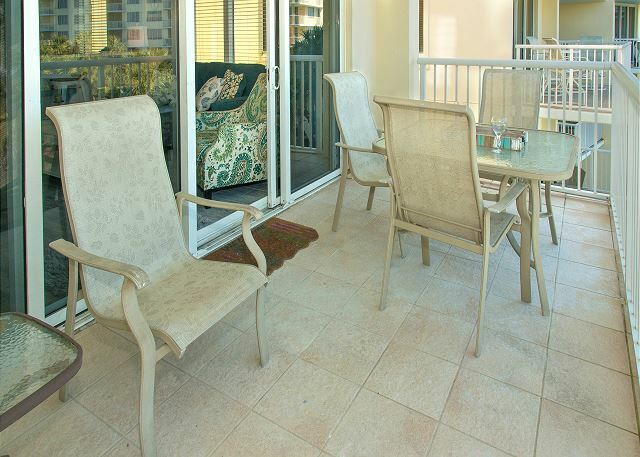 The unit is situated in a nice spot for very easy access to the pool as well as parking. Luggage carts make moving in and out very simple. The pool area was the main event and it didn't didn't disappoint - we must have gone around the lazy river about 20,000 times during our stay. Great place to just kick back and hang out with your kids. Plenty of nearby restaurants nearby as well. Enjoyed our stay for the month of Feb. 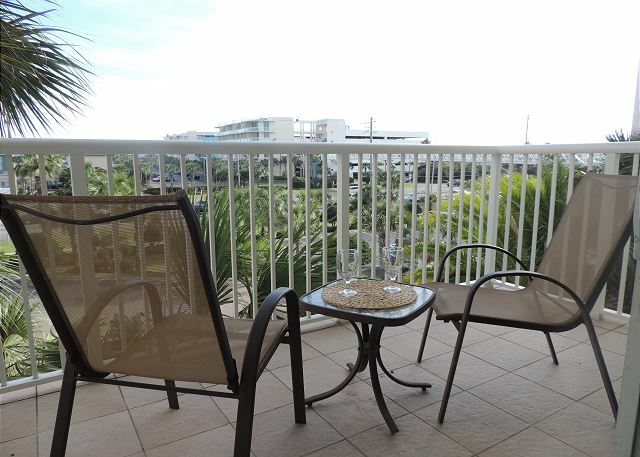 Very comfortable condo with great views and close to everything you may need.